These Holiday Shopping Tips aren’t just for safety over the holidays. They’re tips to help you be more aware of your surroundings. Rather than digging through your Mary Poppins purse (we all have one), have your keys in hand and ready to go. Did you know that you can open ONLY the Driver’s Side Door with a single click of the unlock button on your remote? It also turns on the overhead light. Take an quick glance into the back seat before getting in your car. Then, lock the doors as soon as you are inside. When parking in a large, multi-level parking garage, take 2 seconds, and snap a photo of the level or section your car is parked on. Put your phone away. One of the most important pieces of personal safety is AWARENESS. No text, or cat video is more important than your safety. Seriously, it can wait. So, you just cashed your pay check! Go you. Now, you need to go to the grocery store. You’re flipping through the cash as you pay. You don’t notice the guy three lanes over eyeing your stash. Take out ONLY the amount you need for your purchases. Be careful, and be aware. Have you ever been at the grocery store, and had a toddler on one arm, and that Mary Poppins purse in the other, and an overflowing basket of groceries, only to have someone ask, “would you like help with that?” Yes. Yes, you would. Potential attackers, or those up to no good, are looking for someone who is distracted. Having your hands full, sets you up as a possible target. You’re strong. You’re smart. You don’t have to prove you can balance forty-eleven-hundred bags. Get help. That’s why they’re there. Could I Run in These? First, try to park under a light. Second, know when, what time, exits close. We learned this the hard way. We went to a late movie, but had arrived early and entered in through a main store front. When the movie was over, the entire mall was closed. The only exit was at the theater entrance, on the absolute opposite end of the mall. We were forced to walk around the entire shopping mall, in the dark, after 11pm. A little planning can make a huge difference. Thanks for reading. Share these 7 tips with a friend or loved one. 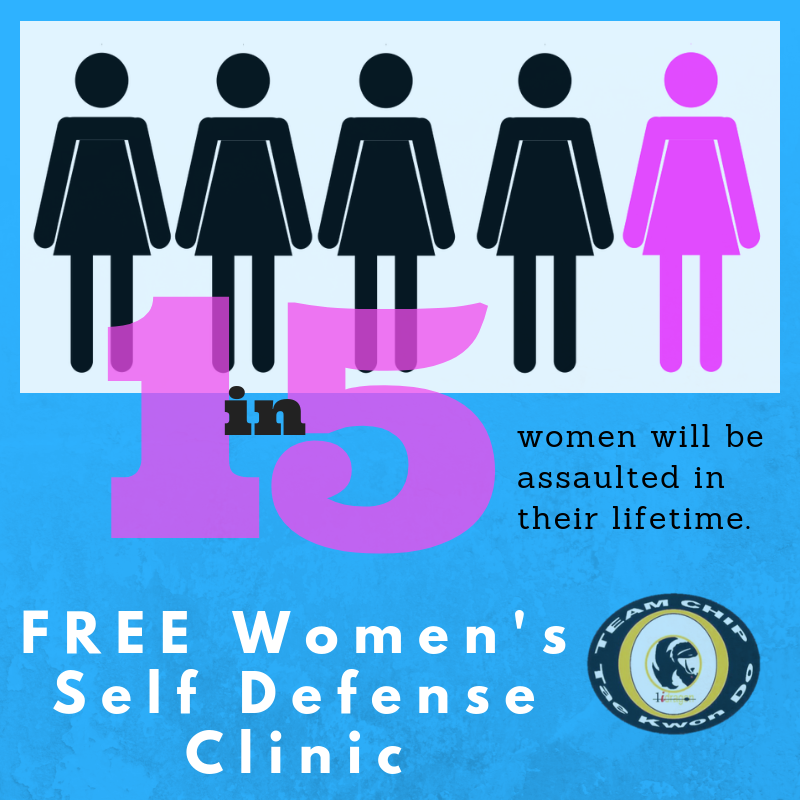 We offer monthly Women’s Self Defense Classes, and they’re FREE. Visit our facebook page @teamchiptkd for dates and future events.